I can’t juggle. Can you? I’ve tried many times. I just can’t do it! I’m amazed at those who can. But, I am learning to juggle in my role as a Shepherd. It’s taken me years to figure it out and to actually be able to do it. But, I’m thankful to the Lord that I’ve learned (somewhat). What do I mean? Last Sunday we had almost 700 people attend our three services. The week before we had over 650. That’s a lot of people for three pastors. So, how do we juggle all of the people? VERY CAREFULLY. 🙂 Truly, the thing that many people don’t realize about a church our size is assimilating all of the new people. What brings you to MPBC? Tell us your story? Do you have a daily “quiet time” or “devotion time” with the Lord where you pray and read the Bible? What do you believe God has gifted you to do in His Kingdom’s work? What do you believe your level of commitment will be as a new member? Is there anything in your life right now that would be a detriment to the kingdom of God regarding your current lifestyle that needs to be confessed or repented of at this time? We Worship as a Family…we worship as a family (no children’s church/youth groups) The Bible teaches everyone is together in the meeting “ecclesia.” There is no Scriptural evidence that the family was ever separated during the ecclesia. That’s a modern invention of convenience, but it’s not Biblical. Rite of Passage (ROP)-Raise the Bar for our Young Adults. Give them a job, apprentice…Mentoring Class, kitchen duty, AV, choir, mission work, services, church-wide functions. We want your entire family to be a part of what we do. We don’t entertain children; we INVOLVE them. Mission-minded-Local: Passion Play, Flag Football League (FFL), Movie Nights, VBS, Sportsmen Banquet, Trunk or Treat. Global: Weslaco, TX and Mexico, Philippines, China and beyond. Contribute: We expect and desire for you to contribute to the church in your time, talent and treasure (10% is a wonderful goal), but we don’t tell you what that is. God will. We don’t want you to just fill a chair. We want you to be involved in YOUR church. Service times: Wed. 5:15 meal, 6:30 Service, 6:30 Children’s classes (birth through 5th grade), Choir Practice 7:30, Praise Team 8:30 pm, Sunday Worship Services- 8:20 am, 9:40 am and 11:00 am. SS/Bible Study 9:40 am. Picture: We’d love the opportunity to have your picture for our reference as a staff and for our Deacons. We’ll do this following this meeting if you don’t mind. That’s not too bad is it? I joke with folks and I tell them that sitting through this 45 min to an hour meeting is not as bad as getting a root canal. Ha! 🙂 But, seriously, it’s a wonderful time to sit down and get to know people. Because we want to know the people who are joining the church, right? Of course! We are confident about the majority of folks who join the church (we have some knowledge of them prior to joining), but we have had the occasion where we don’t know folks as well and we want to make sure we understand their theology and that they understand ours. One of the jobs of a shepherd is keeping wolves out of the flock. Again, we take this seriously. Most churches don’t, to be honest. They’ll let anybody join at any time and that can be dangerous. The next step is to get the new folks plugged into the body life of the church and often this ends up leading to some more discussions and even some counseling. Now, that’s where the juggling comes in. We’ve been blessed to add over 200 people over the last 3 years and that’s a TREMENDOUS amount of time and discussion. It’s hard to describe the time that’s required. That’s why we’ve had to set up some protocol on talking with folks. Why? Because it was totally monopolizing our time and we couldn’t get to everything else. It was hard to find time to study and write sermons, devotions, get to the hospitals, rest homes, etc. So, what is an immediate need? Really just two things. (1) you’re going to the hospital that requires an overnight stay. (2) a death in your family. Those are the two things that we will try to drop everything and get to immediately…no matter what. Outside of that, a person will have to wait. Yes, wait. I know many folks have needs, but usually their situation didn’t pop up overnight and so we’ve had to schedule times with folks so that we can have somewhat of an appropriate and sustainable work/life balance. Without question, we want to care for our congregation and support our staff in maintaining a good balance. During the week, we counsel on Monday afternoons, Tuesdays and Wednesdays. A member can contact our church and set-up a time with one of the pastors/elders. These are 1-hour long times. If more counseling is needed, another appointment can be made. Often, I will ask people to prepare before they come by giving them Scripture to read or some homework that will prepare them for the meeting. This prepares them spiritually. It allows the Lord to begin to work in their lives. I also tell people that I’m not a miracle worker and I try to minimize and bring down their expectations so that they’re not disappointed if things in their lives don’t change overnight (because they usually don’t). I’ve had to learn that I’m not Jesus and I can’t fix every problem or anyone for that matter. It’s a God thing. Something else I’ve learned is the fact that having people make an appointment and wait (when it’s not truly an emergency) gives them time to prepare, pray and think and it does me, as well. It’s like making a doctor’s appointment and you bring your medicines and you think through all the things you want to tell him/her and you are prepared and ready for that appointment. The same is true spiritually. We believe this model is healthy and sustainable as we grow and move forward as a congregation. Believe me…it’s a juggling act…but, I’m getting better at it! The Lord is good. I continue to be amazed at His provision in my life. I see His hand on my family and the church. Now when I say that, “I see His hand…” I’m not meaning that everything is always perfect. You know the Lord allows difficulties into all of our lives to grow us and shape us and mold us into His image. Difficulties and trying circumstances are a part of life. It’s how we handle those circumstances that will determine where our hearts are as they relate to Him. But, I’m grateful for another week. It’s been hectic and busy with funerals and Sunday’s messages and I’m in revival this week at a local church. As a matter of fact, we had 649 people on Sunday for our three services. There was nothing special going on… just an ordinary Lord’s Day. That’s still mind-boggling to me! I admit it! Interestingly, I’ve heard some say that our church is growing because it’s liberal. Can you believe that? Me, a liberal preacher? Are you serious! I laugh when I hear that. I’m probably one of the least liberal preachers around. Don’t believe me? Watch some of the sermons I’ve preached lately online at http://www.mpbc.ws. No, the truth is, there’s all kinds of reasons that folks, (including, sadly, other Christians), will run down another church and I can promise you, (in our case), it’s not because we’re liberal. Perhaps it’s because we don’t use the “right kind of Bible.” I use the ESV, a word for word translation of the original Hebrew, Greek and Aramaic. I heard a NT Greek Professor say one time: “To the degree that your Bible translation is faithful to the original languages of the Bible (Hebrew, Greek and Aramaic), you can be confident you hold the Word of God in your hands.” But, for some, that’s not good enough I suppose. I believe others, perhaps, believe we’re a liberal church because we use other instruments besides a piano and organ. I guess David was wrong when he said we should praise the Lord with the cymbals, trumpets and tambourines (2 Samuel 6:5). Psalm 150:5 says: “Praise him with sounding cymbals; praise him with loud clashing cymbals!” Perhaps it’s just the fact that the Lord is blessing and moving and people are being saved, baptized and are growing in their faith and some don’t like that. Who knows. But, I do know this. It’s all of the Lord. It’s all Him and I give Him the praise and the glory! Yes, I’m finishing up revival tonight at Pleasant Home Baptist Church in Millers Creek. The folks there have been so kind to me. I’m honored they asked me to come and preach and I believe the Lord has been moving in hearts and lives. I’m excited about finishing up in a little while. The Lord is good! In fact, as I’ve thought about and prayed about preaching and teaching the Gospel all week, my mind has been taken back to: “The Story of the Donuts.” It’s a powerful story. Have you ever heard of it. It truly is wonderful! I’ve copied it below and I hope it encourages you as it continues to encourage me. I promise you… if you read it…you will be blessed. There was a certain Professor of Religion named Dr. Christianson, a studious man, who taught at a small college in the western United States. Dr. Christianson taught the required survey course in Christianity at this particular institution. Every student was required to take this course their freshman year, regardless of his or her major. Although Dr. Christianson tried hard to communicate the essence of the gospel in his class, he found that most of his students looked upon the course as nothing but required drudgery. Despite his best efforts, most students refused to take Christianity seriously. This year, Dr. Christianson had a really special, dedicated, student named Steve. He was a tremendous athlete. Steve was studying with the intent of going on to seminary for the ministry. Steve was popular, well-liked, and he was an imposing physical specimen. In other words, he was huge! He was the starting center on the university’s football team, and was the best student in the professor’s class. Well, Friday came and Steve got to class early and sat in the front of the room. When class started, the professor pulled out a big box of donuts. Now, these weren’t the normal kinds of donuts, they were the extra fancy BIG kind with cream centers and frosting swirls. Everyone was pretty excited it was Friday. It was the last class of the day, and they were going to get an early start on the weekend with a party in Dr. Christianson’s class. Woohoo! Dr. Christianson went to the first girl sitting in the first row and asked, “Cynthia, do you want to have one of these donuts?” Cynthia said, “Yes.” Dr. Christianson then turned to Steve and asked, “Steve, would you do ten push-ups so that Cynthia can have a donut?” “Sure…” Steve jumped down from his desk to do a quick ten. Then Steve hopped back up and sat in his desk. Dr. Christianson put a donut on Cynthia’s desk. Dr. Christianson then went to Joe, who was seated behind Cynthia, and asked, “Joe, do you want a donut?” Joe said, “You bet I do.” Dr. Christianson asked, “Steve would you do ten push-ups so Joe can have a donut?” Steve did ten push-ups, and Joe got a donut. And so it went, down the first aisle, Steve did ten push-ups for every person before they got their donut. Walking down the second aisle, Dr. Christianson came to Scott. Scott was on the basketball team, and in as good condition as Steve. He was very popular and never lacking for female attention. When the professor asked, “Scott, do you want a donut?” Scott’s reply was, “Well, I can do my own push-ups?” Dr. Christianson said, “No, Steve has to do them anyway, whether you take the donut or not.” Then Scott said, “I don’t want one! That’s not fair!” Dr. Christianson shrugged and then turned to Steve and said, “Steve, would you do ten push-ups so Scott can have a donut he doesn’t want?” With perfect obedience Steve started to do the ten push-ups. Scott said with a red face, “HEY! I said I didn’t want one!” Dr. Christianson said, “Look! This is my classroom, my desks, and these are my donuts. Just leave it on the desk if you don’t want it. Now sit down!” And he put a donut on Scott’s desk. Now by this time, Steve started to slow down with the push-ups. He was starting to tired. He was now just staying on the floor between sets because it took too much effort getting back into his seat. You could see the sweat beading on his forehead and sliding down his cheeks. Dr. Christianson started down the third row. Now the students were beginning to get more angry. Dr. Christianson asked Jenny, “Jenny, do you want a donut?” Sternly, Jenny said, “No.” Then Dr. Christianson asked Steve, “Steve, would you do ten more push-ups so Jenny can have a donut she doesn’t want?” Steve did ten….Jenny got a donut. By now, a growing sense of tenseness and unease filled the room. The students were saying “No” with greater fervor and all across the room there were all these uneaten donuts on the desks. Steve was now really putting forth a lot of effort to get the push-ups done for each donut. There began to be a pool of sweat on the floor beneath his face, his arms and face were bright red because of the physical effort Steve had expended. Now, Dr. Christianson asked Robert, who was the most vocal unbeliever in the class, to go over and watch Steve do each push up to make sure he did the full ten push-ups in a set. He told Robert, “Make sure he does them all.” Robert complied. He didn’t like Steve anyway. He thought he was a “goody-goody” and so, he watched Steve closely and Dr. Christianson started down the fourth row. From time to time however, other students from the class across the hall would come into Dr. Christianson’s class. The professor across the hall would not allow late-comers to barge into his class, but they would be counted present if they attended Dr. Christianson’s class. About that time, 4 students walked in and sat down on the steps that ran along the back wall of the room. As they came in they said: “Mmmm… We can smell the donuts!” When Dr. Christianson realized this, he did a quick count and saw that there were now 34 students in the room. He started to worry if Steve would be able to make it. Dr. Christianson went on to the next person and the next and the next. Steve was really having a rough time now. He was taking a lot more time to complete each set. Steve asked Dr. Christianson, “Do I have to make my nose touch on each one?” Dr. Christianson thought for a moment and then turned to Robert the atheist and said, “What do you think, Robert?” Robert looked at Steve as Steve was lying on the floor with his arms beginning to shake and Robert said, “It’s alright…he doesn’t have to touch his nose to the floor.” Steve looked up at Dr. Christianson and then to Robert and said, “I’ll do them right. Nose to the floor.” Dr. Christianson, now with tears in his eyes didn’t say a word and continued on. Just at that moment, Jason, a notoriously late student started to walk in to the room when all the students yelled in one voice, “No Jason! Don’t come in! Stay out!” Jason didn’t know what was going on. Steve picked up his head and said, “No, let him come.” Professor Christianson said, “Steve, you realize that if Jason comes in you will have to do ten push-ups for him?” Steve said, “Yes, let him come in. Give him a donut” Dr. Christianson said, “Okay, Steve, I’ll let you get Jason’s out-of-the-way right now.” He asked, “Jason, do you want a donut?” Jason, new to the room of course, hardly knew what was going on and said, “Yeah! I’ll take a donut.” “Steve, will you do ten push-ups so that Jason can have a donut?” The class groaned! Steve did ten push-ups very slowly and with immense effort. Jason, bewildered, was handed a donut and he sat down and bit into his donut, while everyone glared at him. Dr. Christianson finished the fourth row, and then started on the late-comers seated in the back of the room. Steve’s arms were now shaking violently with each push-up in a struggle to lift himself against the force of gravity. By this time, sweat was profusely pouring off of his face. There was no sound in the room except his heavy breathing and the splattering of sweat on the floor. Oh…and the muffled sobs of some of the girls as they sniffed away the tears. Even the guys were struggling to watch this display. The last two students in the room were two young ladies…very pretty and very popular. Perhaps as you read that story, it moved you. Perhaps there were tears in your eyes or a lump in your throat. Do you know what I find interesting about that possibility? It’s the fact that we can be moved by a story of a young man struggling to do push-ups, yet the Lord and Savior of the world was slaughtered on a cross and because we’ve heard the story so much, we are hardly blink an eye. Why? Because we’ve forgotten how good it is to be saved and just how blessed we are! We have little excitement or passion in us about our Lord Jesus because He’s become commonplace. Why don’t we thank Him for His precious salvation. As I begin to type the words to this chapter, I sit in my small office in my basement and I look around at it and its contents. It has a small desk, a chair, a book case and a filing cabinet. It has some Christmas wrapping paper, a few boxes and my golf clubs that haven’t been used in almost four years. My little office has a small table with an old fax machine on it and about a dozen, small, framed pictures of various members of my family. There is a picture of all the children when they were small. There’s a picture of my grandmother, who has gone to be with the Lord and another one of me and Pam when we were first married twenty years ago. There is also a picture of me singing with a quartet that I sang with for about ten years. As I look at those pictures and think about those days that are in my past and I think about where I am today, writing this book, I’m struck with a sobering thought: I can’t go back. Have you ever had that thought? I guess we all have at one time or another. We know we can’t go back and relive another day. When the day is gone, it is gone. Knowing that is good and bad. There are so many things I wish I could go back and do over. We’ve all said it: “If I only knew back then what I know now.” What is it that I know now that I wish I had known back then? Honestly, it’s what I’m trying to write in the pages of this book. Yes, this book is entitled “Rite of Passage,” but it’s about so much more. For years as a husband, father, businessman, deacon, choir member, quartet singer, and member of several community groups, I found I was running wide open. I never seemed to have enough time to do anything well. I was trying to do it all. Here’s the problem with the way I was living: I was missing it! In Chapter 3 I spent quite a bit of time sharing about the role of the church in helping families raise Christ-centered adults. We looked at many passages of Scripture and by now we should all realize that the responsibility of raising children falls to the parents, principally the fathers. Certainly, you can go back and review those passages found in Genesis 18:19, Deuteronomy 6:1-7, Psalm 78 and Ephesians 6:4 any time you would like. The point is clear: fathers are to be leading the way in discipling in our homes. The truth is that I wasn’t leading in my home even 10 years ago. I hate to admit it, but it is the truth. I was succeeding in everything except in being the spiritual leader in my home. What became crystal clear to me through several incidents and God-ordained experiences was the fact I needed to change or I would lose my family. Am I saying my wife was going to walk out on me and take the kids? Not necessarily, but I am saying I was in danger of raising children that would potentially never truly see a genuine, sincere faith in Jesus Christ. I was leaving this teaching to others because I was too busy to oversee it. I had been climbing the proverbial ladder of success and when I reached the top, I found that the ladder was leaning against the wrong wall. Why am I taking the time to tell you all of this? Because I want you to know and understand that I am where I am today, in pursuit of building a Christ-directed life, by the grace and mercy of God. The whole idea of Rite of Passage is something that God has revealed to me gradually over the years and it has been a process for me. I didn’t just get here overnight. What I am providing in the pages of this book is a culmination of the last ten years of my life. Indeed, I have learned the hard way what the Bible teaches about leading in my home, and I’m still learning. As I think back, I realize I wasn’t making disciples of my children because I didn’t understand what was involved. I thought if I got my family to church each Sunday and I served on a few committees and tithed, I had my bases covered. Yet, I knew there was more. But, what was it? Did I need to serve more or be more involved at the church or give more money? What was this nagging in my soul? Finally, I attended a conference where I was challenged as a man. I had never been challenged like this before in the spiritual realm. I had been challenged as an athlete, at the office and even in the studio recording a CD with a quartet, but never like this. The Scriptures opened my eyes to what I knew intuitively, but couldn’t quite grasp: I must truly become a disciple of Christ to make disciples. I must lead my home by dying to myself. I realized for the first time in my life that it was my job to disciple my children, not that of my wife, not the church, or anyone else. This was a life-changing experience for me that sent me on a journey that has since led me to some amazing places. I can often be an open book about my life. Some may say that I’m too open. I guess that’s probably true, but I sincerely believe it’s important that you know where I’m coming from, particularly if you are a dad reading this book. Please hear my heart! I was a successful business man, had a good marriage and wonderful children. I had also been to the top of what most laymen would consider the pinnacle of Christian service. Yet, I wouldn’t trade anything for the way my wife and children look at me now. Something amazing happened in my life over a period of about nine months of soul-searching. The Lord transformed my thoughts, simplified my focus and challenged me to do what he created me to do. He had given me a passion for truly becoming a committed, dedicated disciple of Christ. My desires changed dramatically. God turned my heart toward my home and discipling my children. I discovered I was to be a walking dead man. That’s what it means to be a living sacrifice. I learned I am to be holy. Yes, as believers we are called to be holy. But, I had excused away this whole idea by saying, “No one is perfect.” So, I didn’t even attempt to live a holy and righteous life. Don’t get me wrong. I was good, as compared to the worst “Christians” I knew; but being holy and righteous, only Jesus could embody those qualities. I had been deceived. So, many things changed in my home. This is not to say we had a home filled with overtly sinful things. We didn’t. As a family, we decided to do our very best to live a sacrificial life before the Lord. Therefore, TV shows, music and movie preferences changed. I slowly began to untangle myself from the world and secular worldviews that had been filling my brain since childhood. I became a student of the Bible. I sincerely began studying the Scriptures. I replaced so much wasted time watching TV and surfing the internet with Scripture reading and just spending valuable time with my family. I learned that it is indeed true that you will never be any better in public than what you are in private. So, I had to sacrifice sleep in order to get up early, get into the Word and meet with Jesus. I came to realize that for years I had desired sleep more than I had desired being with the Lord. Over time, my walk with the Lord became so much sweeter and more relaxed. It’s difficult to describe in words, but I hope what I have shared helps you to understand what God was doing in my life. Basketball and Snow-What a Combination! 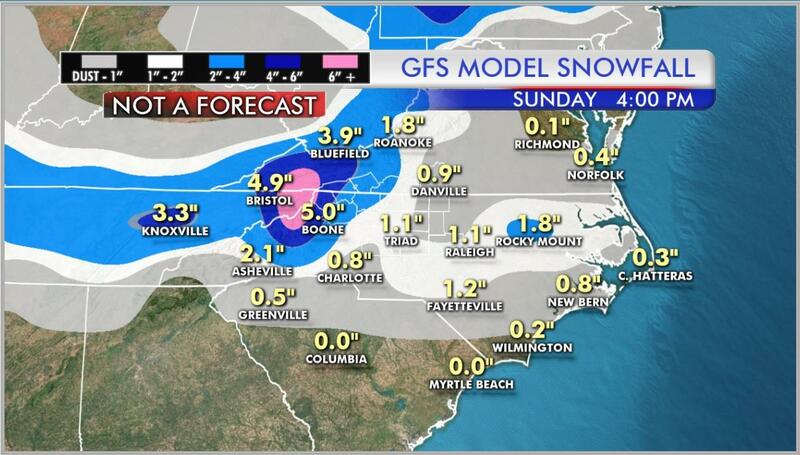 Here’s the latest forecast from our United States model called the GFS. The system is still off the west coast and that’s why the confidence is so low. Honestly, we won’t know until tomorrow when it gets onto the continental US that the models can really pick up on what’s going to potentially happen. My favorite forecaster is Van Denton and this is what’s on his Facebook page. The top one is the European Model and the bottom one is the GFS (US Model). Still way too early to have a good fix on specifics for Saturday night/Sunday morning, but here is what the 2 models show that go out that far. 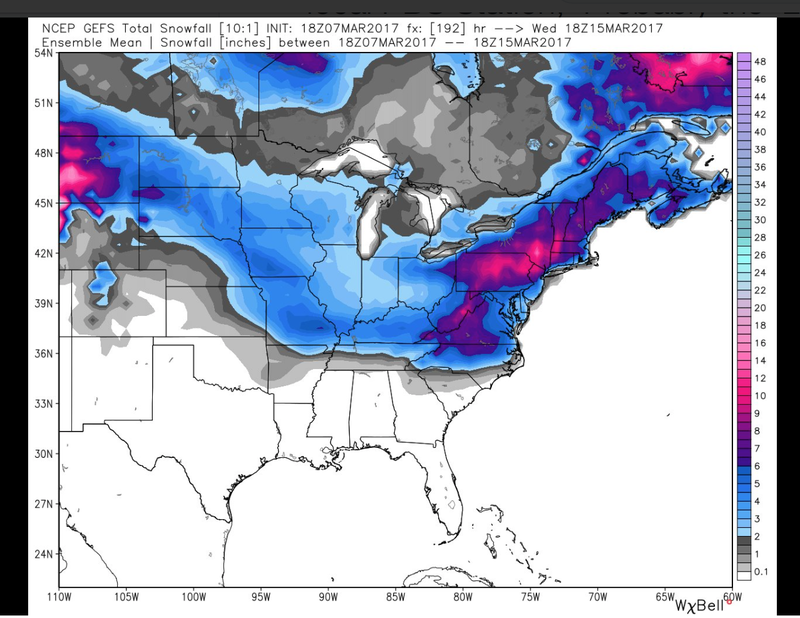 The GFS has lowered amounts from the past 2 days and last night and the Euro has remained about the same. We expect colder air to push in from the north on Saturday and an area of low pressure to arrive from the south on Saturday night and pass to our east on Sunday. 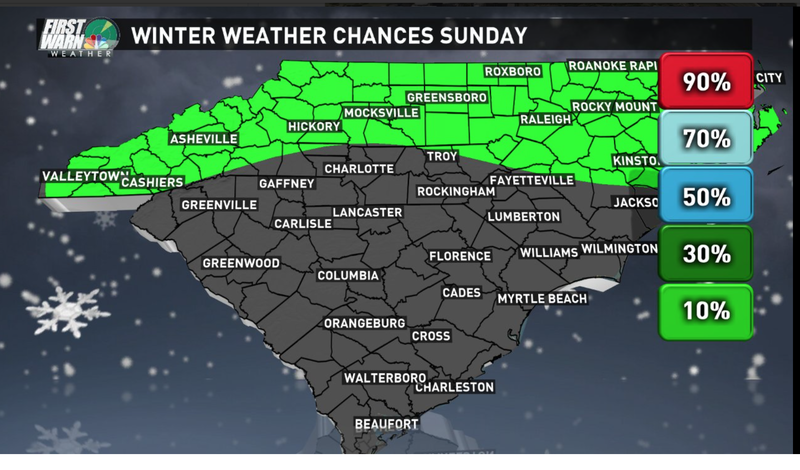 This combination would produce the snow chance that the models are showing. The ground is warm and that would cut into amounts that we see accumulate. 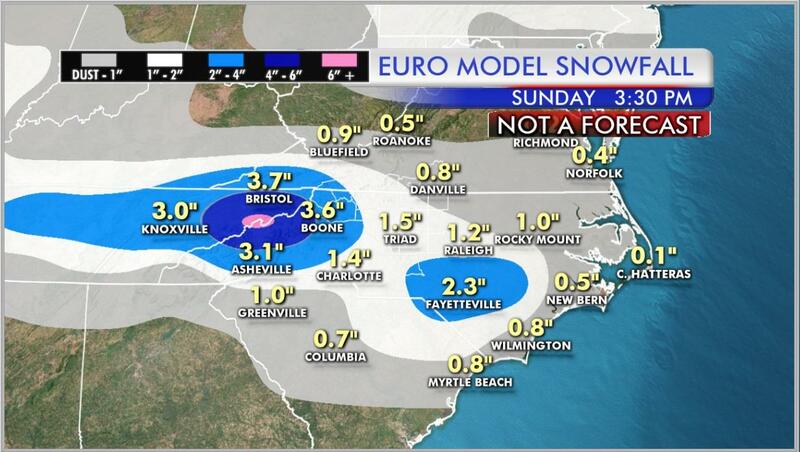 One thing to note about the models, they show the amount of snow that actually falls based on it all sticking. With a warm ground, much of it would melt and depth would likely remain below what a model actually shows. By tomorrow night the energy will reach the mainland (currently over the Pacific Ocean). Once it reaches land, we will get better data from Weather balloon sounds which take measurements within the storm. Then we will have a much better idea what to actually expect from this system. We usually start putting out OUR forecast for snow amounts within 48 hours. We had that 22″ amount at my house. Unreal! Mt. Mitchell got 5 feet!!! 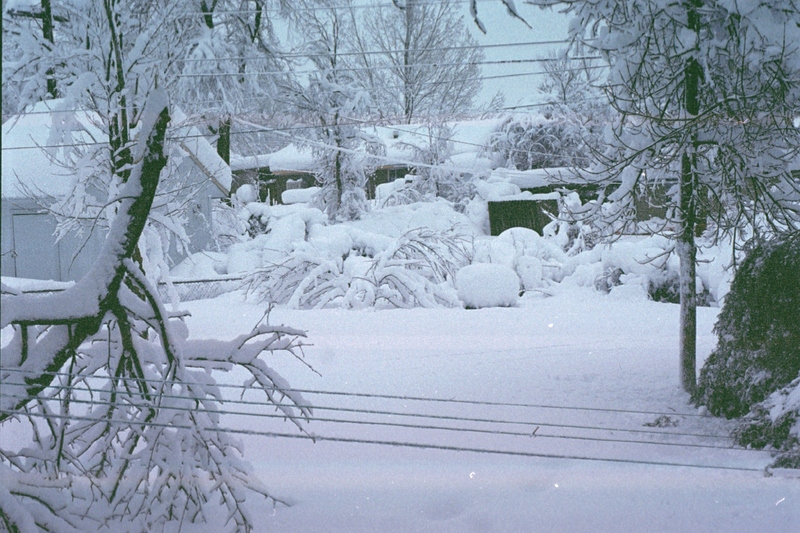 I remember the snow drifted up to four feet in some places around the house. It was truly an amazing event! 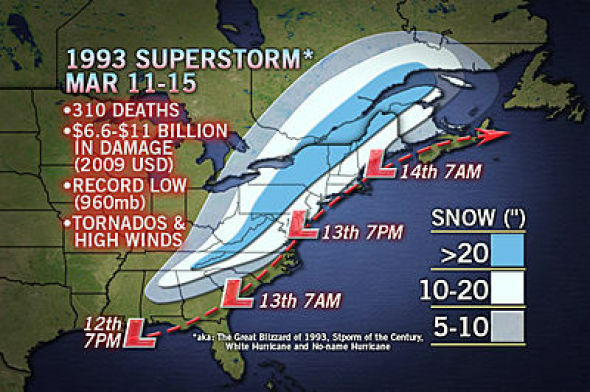 Well, you can be sure we’re not looking at anything like that…but, nonetheless, the timing of the event being March 11 and 12 this Saturday and Sunday is very similar to 1993 in timing. So, enjoy the weekend! I will! Snow and Basketball! Wow! What a potential combination! This week’s Two-Minute Tuesday, “Children in Big Church? It’s up to over 4,300 views. Amazing! 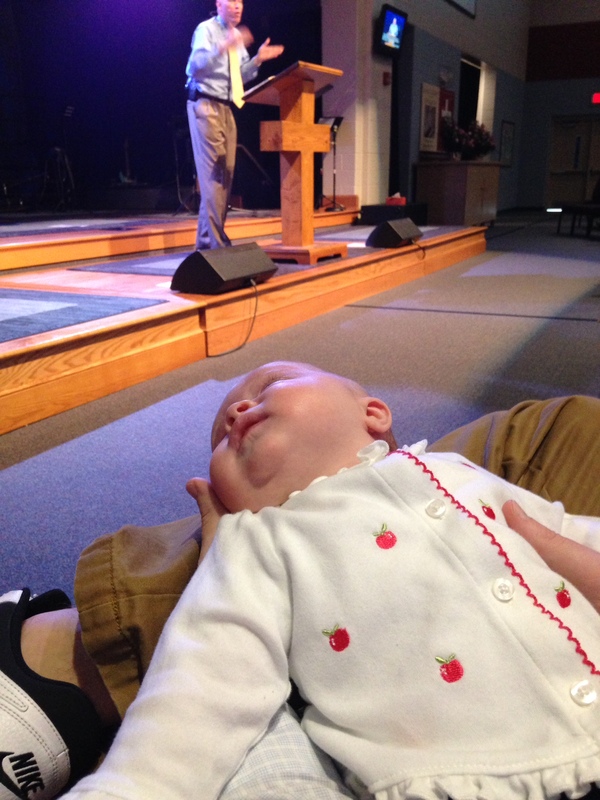 That’s Charlotte, my granddaughter craning her head to hear her Papa. What a beautiful example of children being in the church. As I preach each week, people will say, “I’m sorry my child was making noise,” or “Sorry we had to get up and go to the cry room.” Honestly, I don’t notice any of it. And truly, I’m grateful that we have a church that’s okay with children in the meeting. Jesus said, “Suffer the little children to come unto me.” What a blessing! At the funeral yesterday, I preached a message and included Psalm 15 (the “Psalm of Integrity,” as it is sometimes called). He had defended our nation in the Korean conflict and for that I was grateful. As the VFW Honor Guard fired off a 21-gun salute, I was humbled. 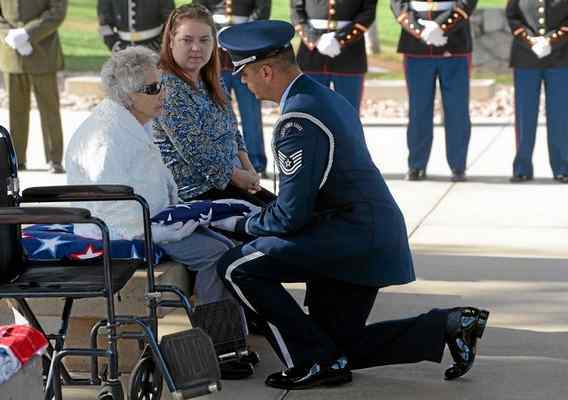 When you see a veteran with a hat on signifying their branch of service, thank them. Walk up to them and shake their hand. Buy their lunch. But, show respect and honor to those men and women who risked it all for us. No, I’m not saying we should put patriotism over Jesus. But, I am saying that as Christians, we should respect those who kept their word to our nation and defended us far and wide so that we have the freedoms we enjoy today. Do you have tender vegetation blooming? If you are in North Carolina, they are probably going to get bitten tonight. 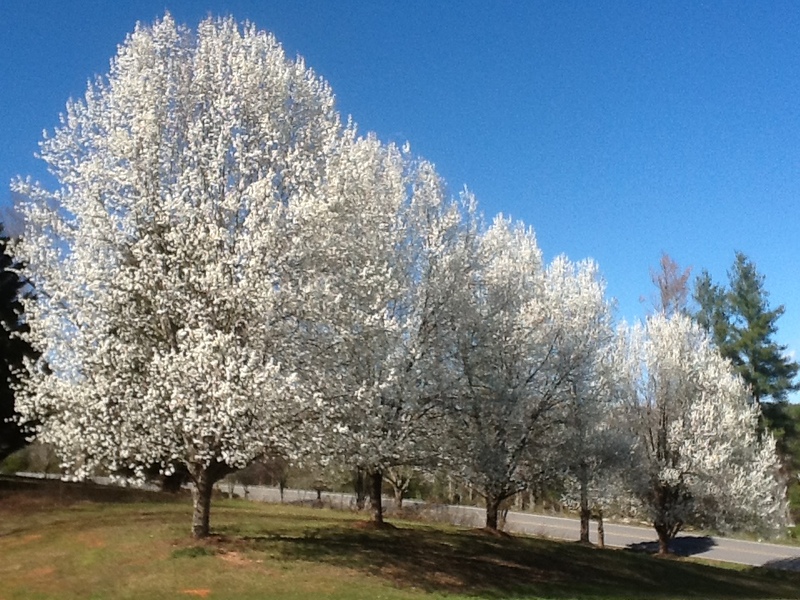 Like the Bradford Pear trees at the bottom of our driveway. I’m really worried for the apple growers. It’s supposed to hit 24 degrees tonight. That could wipe out the apple crop this year for some farmers. Would you join me in praying for them? The Lord knows and we trust Him in all things. In the good and the bad He will sustain us and provide for us. Let’s be there for our neighbors and show the love of Christ.